Are you an active and current Google user? If is yes, then you must be concerned with the question, how to check your Gmail data storage. If not, then I guess you already know how to check Gmail data storage. However for new users, before we learn how to check your Gmail data storage let us take a little trip about Google. Google a web and mail platform that allows users to store up to fifteen gigabytes (15gb) to the cloud on their account with the possibility of increasing the space if you wish to. However, when you have a lot of things stored on your Google account, it can eat up that space more quickly than you think. 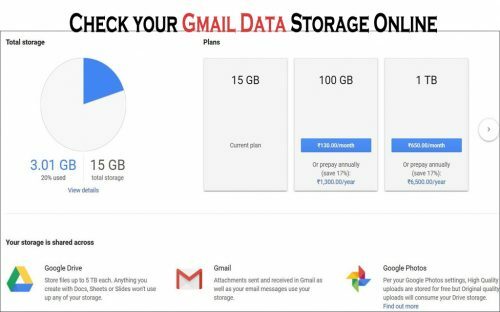 You can easily manage that space when you know how much of your space is remaining on the Google account and that is why we are undergoing the process of learning checking your Gmail data storage. There are so many reasons that have driven so many people to check their Gmail data storage. And some of them are such as wanting to upload a big file to save it there but wants to see if there is enough space for it. Now saying it plain like that might not be meaningful so let me elaborate. Uploading a file to your Google account takes data. Which means you having it there costs you the same data the file is worth on your device so if you upload the file and then it fails while uploading; it means that data is already wasted. Visit the official Google drive website online at https://www.google.com/drive/. Enter your Google account and you will be redirected to your Google account storage online. Look at the cloud icon by the left navigation pane and you will find your data usage. Above is how to check your Gmail data storage online. Alternatively, if your Google account is signed in to your device you can check your Google data storage by visiting the official Google data storage analytics webpage at https://one.google.com/u/1/storage?hl=en&pageId=none.